We know the situation. You’re coming down from Mt. Bachelor and you’re starving. You’ve called to see how long pizza delivery is and you’ve got a wait. You remember from last year that trying to go into many of the restaurants in the Village means a long wait with grumpy kids who need dinner to boost their spirits. And speaking of spirits, you could really go for a tasty cocktail after waiting in the line of cars coming back down from the mountain. If this sounds a bit too familiar, we have a solution. Many of our guests might be excited to learn about dining options on Spring River Road, just outside of Sunriver proper. 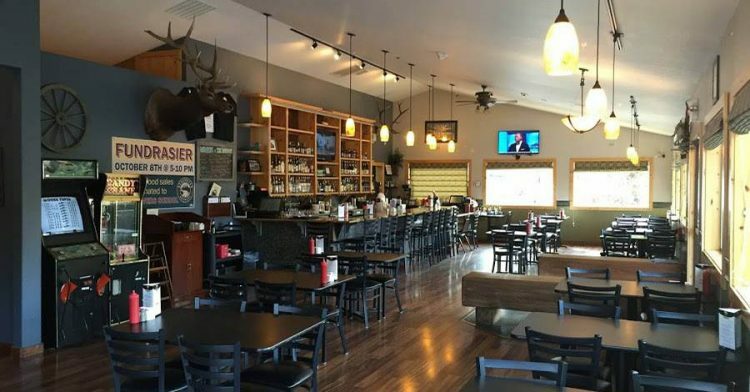 When it comes to Sunriver dining options, The Wallow Bar & Grill offers guests a comfortable experience and a home cooked meal on your way back from Mt. Bachelor. When trying to beat the crowds, here’s our #sunriversavvy tip this holiday season – try dining out at The Wallow, located just outside of the entrance to Sunriver. The Wallow offers guests a spacious restaurant atmosphere that feels like a cabin to enjoy tasty home cooked meals. With a couple TVs, a couple arcade games and a fully stocked bar, the entire family will be able to enjoy a meal together at The Wallow Bar & Grill. A local’s favorite Sunriver dining spot, The Wallow boasts an extensive menu with great appetizers that can be enjoyed apres ski, delicious salads, a variety of sandwiches and burgers, as well as large plate entrees sure to delight. With weekday specials, you’ll be excited to try Taco Tuesday or the ribs on Thursdays. Creole BBQ Prawns – Sauteed with garlic, fresh herbs, lemon zest and a spicy tomato-butter sauce and served over a smoked cheddar grit cake. Are you drooling in anticipation yet? Smoked Prime Rib French Dip – House smoked prime rib shaved and served with Swiss cheese and a side of rosemary au jus. Mmmmmm. Elk Burger – While game meat may not be for everyone, this burger may convince you otherwise. An elk burger topped with bacon, smoked gouda, arugula, caramelized onions and a maple-dijon glaze. 12 oz. Ribeye Steak – How can you go wrong with a ribeye? Served with sauteed mushrooms, a loaded baked potato and grilled asparagus, you’ll be impressed with this tried and true favorite. In addition to daily specials, enjoy Happy Hour at The Wallow from 4-6pm Monday-Friday. During the week between Christmas and New Years, stop off at The Wallow on your way back down from Mt. Bachelor to enjoy happy hour specials on food and drinks. With high-quality food at reasonable prices, as well as a cozy atmosphere, The Wallow may become your new favorite restaurant in Sunriver. When you’re looking to escape the crowds in The Village, we recommend heading over to The Wallow for lunch or dinner. On Saturdays and Sundays, diners can enjoy breakfast at The Wallow starting at 7am. Try the Wallow Scramble, you won’t regret it.